The Power of Attorney is, like most documents in Jewish law, prepared and signed by the witnesses and not by the parties. By the ceremony of symbolic seizure and by the conveyance of four ells of ground to the attorney, the latter became invested with all the powers specifically defined in the instrument. The foregoing formula contains all the necessary and formal words required by the law. 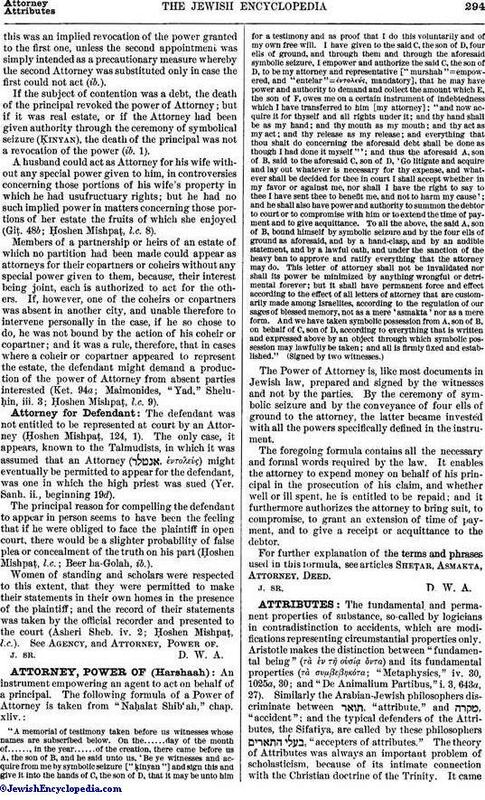 It enables the attorney to expend money on behalf of his principal in the prosecution of his claim, and whether well or ill spent, he is entitled to be repaid; and it furthermore authorizes the attorney to bring suit, to compromise, to grant an extension of time of payment, and to give a receipt or acquittance to the debtor. For further explanation of the terms and phrases used in this formula, see articles Sheṭar, Asmakta, Attorney, Deed.